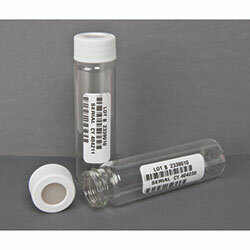 Thermo Scientific I-Chem Certified™ 300 series vials meet or exceed U.S. EPA “Specifications and Guidance for Contaminant-Free Sample Containers,” and are provided with sample-analysis labels, unattached. Thermo Scientific I-Chem Certified 300 series vials include a Certificate of Analysis with a bar code production number in every case. Each vial in the 300 series has a bar code label for absolute traceability, and is for use with automated or manual sample tracking systems.